Arizona Coyotes' forward Alex Galchenyuk awaits a face-off during a game against the Vegas Golden Knights, at Gila River Arena, in Glendale, Ariz., on Dec. 30, 2018. Selected third overall at the 2012 NHL draft, the naive assumption of a teenager was that every team in the league got similar news media attention. In the second season of a three-year, US$14.7-million contract he signed with Montreal in July, 2017, Galchenyuk said he’s happy his former team is doing well, but isn’t interested in putting stat sheets side by side. “He’s been good for us,” the all-star defenceman said. “He’s started to pick it up a bit lately. The Coyotes (22-22-4), who visit the Ottawa Senators on Tuesday before their short trip to Montreal, are 5-1-1 over their past seven games following Sunday’s 4-2 victory in Toronto over the Maple Leafs. 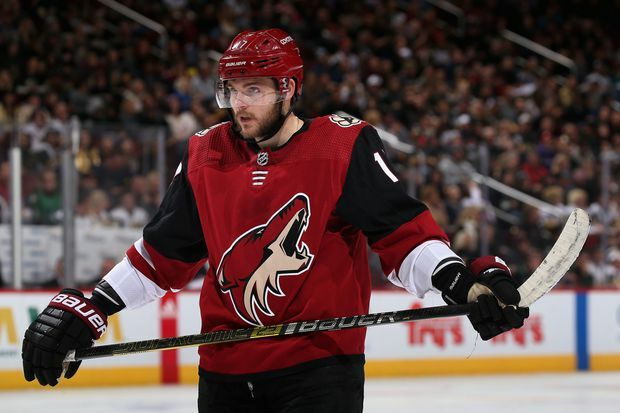 Arizona has moved within four points of the second wild-card spot in the congested West — and Galchenyuk is part of the reason why.